The BBC announces filming has begun on the sixth season of the Call the Midwife TV series, and the 2016 Call the Midwife Christmas special. Call the Midwife airs on BBC One in UK and PBS in the US. The eight-episode sixth season will be filmed on location at the Chatham dockyard, in London’s East End, and in the studio in Chertsey, Surrey. The Christmas Special is to be shot on location near Cape Town, South Africa. Season six of Call the Midwife, which will be set in 1962, stars Jenny Agutter, Linda Bassett, Miranda Hart, Judy Parfitt, Helen George, Bryony Hannah, Laura Main, Emerald Fennell, Charlotte Ritchie, Victoria Yeates, Kate Lamb, Stephen McGann, Jack Ashton, Ben Caplan, and Cliff Parisi. Get more information from this BBC press release. Made by Neal Street Productions for BBC One, the award-winning drama series Call The Midwife has begun filming for a Christmas Special in 2016 and new series of eight episodes in 2017. 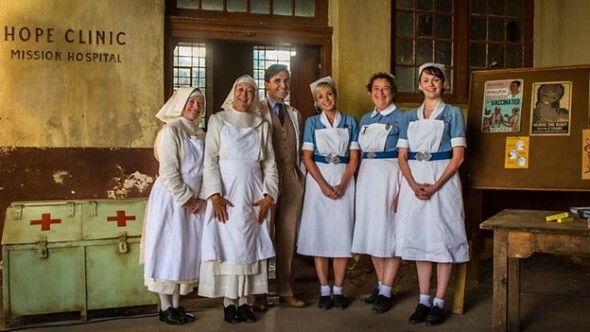 Created and written by Heidi Thomas, the sixth series of eight episodes will be filmed on location at the historic Chatham dockyard, London’s East End, and Call The Midwife’s studio base in Chertsey, Surrey. The Christmas Special will be filmed on location near Cape Town, South Africa. The Christmas Special this year will see Call The Midwife transported to the Eastern Cape of South Africa. Nonnatus House receives an SOS from a tiny mission hospital. Understaffed, underfunded, and with a poor water supply, struggling Hope Clinic is faced with closure. Can our much-loved medics and midwives make a difference to the people whose lives depend upon its work? Far from home and everything familiar, the team are both shaken and exhilarated by the challenges they face – and by the time the mission trip is over, some lives are permanently changed. Sinead Cusack joins the Christmas Special cast, playing Dr Myra Fitzsimmons who runs the threatened Hope Clinic. Regular cast currently filming near Cape Town are Jenny Agutter (Sister Julienne), Linda Bassett (Nurse Crane), Victoria Yeates (Sister Winifred), Laura Main (Shelagh Turner), Stephen McGann (Dr Turner), Jack Ashton (Tom), Helen George (Trixie), Charlotte Ritchie (Barbara) and Cliff Parisi (Fred). Production will then return to the UK for the eight episodes in series six. It is now 1962, and the Nonnatus House team are as committed to caring for the people of Poplar as always. However, the social revolution in the outside world is mirrored by change and challenge much closer to home. As they strive to help mothers and families cope with the demands of childbearing, disability, disease and social prejudice, our beloved medics must make choices – and fight battles – of their own. Series six will see them laugh together, cry together, and pull together, supporting each other as never before. Miranda Hart (Chummy) makes an appearance in the Christmas Special, and returns to Nonnatus House for the series from episode one. Made by Neal Street Productions for BBC One, Call The Midwife has been one of Britain’s most popular drama series since it launched in 2012 and it continues to be one of the most watched dramas in the UK, with all five series to date gaining over 10m viewers. The series five finale was this year’s most-watched drama episode in the UK, with overnight figures of 9.2million and a 38.4 per cent share of total TV viewing. Inspired by the memoirs of the late Jennifer Worth, Call The Midwife is created and written by Heidi Thomas; executive producers are Pippa Harris and Heidi Thomas. Executive producer for the BBC is Elizabeth Kilgarriff with Ann Tricklebank as producer. Call The Midwife is a Neal Street Production for BBC/PBS. Series six stars Jenny Agutter, Linda Bassett, Miranda Hart, Judy Parfitt, Helen George, Bryony Hannah, Laura Main, Emerald Fennell, Charlotte Ritchie, Victoria Yeates, Kate Lamb, Stephen McGann, Jack Ashton, Ben Caplan, and Cliff Parisi. What do you think? Are you a fan of the Call the Midwife TV show? Do you plan to watch the sixth season? More about: BBC One TV shows: canceled or renewed?, Call the Midwife, Call the Midwife: canceled or renewed?, PBS TV shows: canceled or renewed? Call the Midwife: Is the PBS TV Show Cancelled or Renewed for Season Nine? Call the Midwife on PBS: Cancelled or Renewed for Season Eight? When is season 6 starting?? Can’t wait! !